Each gases comes inside our amazing labeled glass vial as usual. 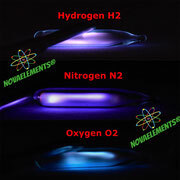 Each gases can be lighted up with a high voltage transformer 2kV or with a simple Tesla bulb, not on sale here. Purity of each gases is 99,99%. COMPLETE Alkali metals argon sealed set 99,9% min.